I’m not sure how we got to Thursday of this week already! Without further ado, the winner of the goodEGG Industries giveaway is commenter #6 – Gillian whose favourite Canadian designer is Dace. Enjoy the Hand & Shadow tshirt! 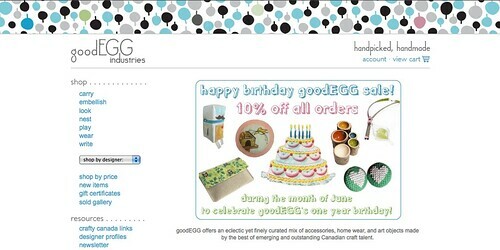 Thank you so much to goodEGG Industries for letting me host their one year anniversary giveaway. It is wonderful to have such an amazing showcase for Canadian crafty talent. It has been 6 whole days since you have posted. I was about to go into serious withdrawal!!! Congrats to the winner of this awesome contest!! Sorry Nora! For some reason I’ve just not been able to get any blogging done. But I’m planning a whole slew of posts for over the weekend and into next week to make it up to you. How do I pick up my prize? Send me an email.